Have you used SignUp Genius yet? It is a great tool to help organize and go paperless (and headacheless)! We recently used SignUp Genius school-wide for parent teacher conferences and it was so much easier than our old way of scheduling. 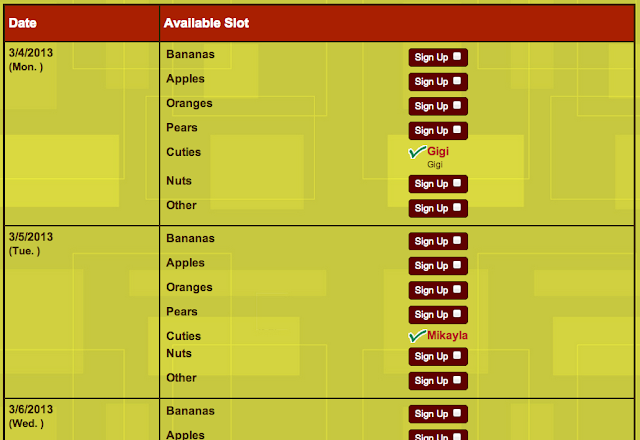 Once I set up my conference page with time slots I sent it out to parents and let the sign ups roll on in. There were only a few parents that I had to remind or talk to personally to help them get scheduled, but it was nice to have something so handy! Recently I've been distraught when I see the snacks and lunches that my kiddos bring. I've always stressed the importance of bringing fresh fruit/veggies as a snack instead of pre-packaged/processed junk, but few do. 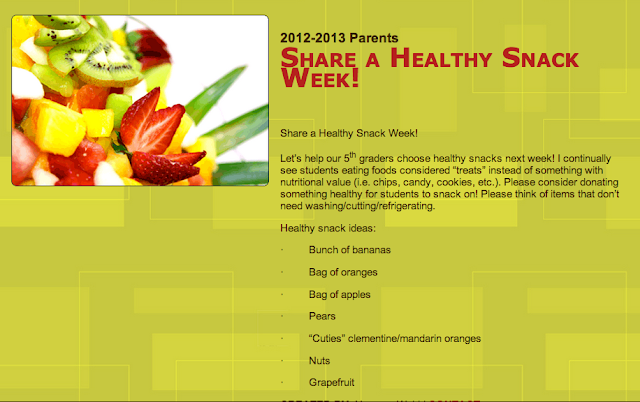 So, I decided to declare next week, our last week before spring break, "Share a Healthy Snack Week". It took mere minutes to set up a SignUp Genius page and email it out to parents, and within an hour I already had two parents signed up. SignUp Genius is very user friendly. You can create a group and add all of your parent emails, they are saved for any future sign-ups. Creating a sign-up is easy, just follow the steps and you can sit back and watch the notification emails roll on in. It's also easy to send out reminder emails to those who have not yet signed up. For parent teacher conferences I was able to easily print out a copy of the schedule to stick on my door and to keep handy while meeting. You can even send the paper copy to any families that may not use email. Oh, and did I mention that SignUp Genius is totally free? Well it is! Tell me how you use this awesome tool! I bounced over here from Nick's blog Sweet Rhyme & Pure Reason. Love your products...so cute. I have been dying to use the sign up genius...and for parent/teacher interviews it would be awesome! Thanks for sharing the information! I am your newest follower. 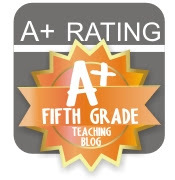 Hop over to my blog and see if there are any FREEBIES you might be able to use...I teach grade 6! Thanks and welcome! What an awesome blog and I love the freebies!